IQAir New Edition Healthpro Compact air purifiers are now 32% quieter, deliver 25% more clean air and have 38% longer filter life. 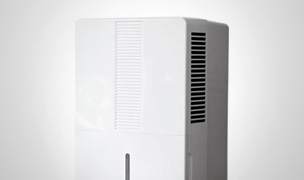 The IQAir HealthPro Compact air purifier has superior HEPA filtration for excellent allergen control. See our ratings & reviews. For particle filtration. Includes pre-filter and HyperHEPA filter. 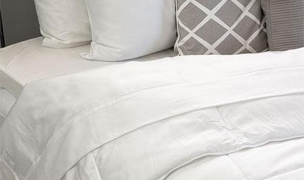 Covers up to 1238 sq. ft.
An IQAir air purifier is the best investment you can make in your health and worth every penny. IQAir air purifiers provide a level of air purification that others can only dream of emulating. IQAir's revolutionary HyperHEPA filtration system is proven to capture 99.5% of all particles down to 0.003 microns, 10 times smaller than a virus. That's a filtration efficiency rate 100 times greater than a standard HEPA air purifier's claimed efficiency of 99.97% at 0.3 microns. IQAir air purifiers are the only air purifiers proven to filter these ultra-fine particles, which make up over 90% of the pollution in the air and are the most harmful to your health. The IQAir HealthPro Compact air purifier is slightly smaller in size than the best-selling IQAir HealthPro, which makes it a more attractive choice for smaller-sized rooms. Do not be mistaken by its smaller size, these units have the ability to an area as large as 1238 square feet and are built to the same standards and performance requirements as the larger models. 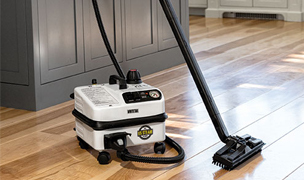 The IQAir HealthPro Compact does not include any carbon for gas and odor removal. 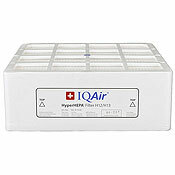 If you want excellent particle and gas removal please see our Exclusive IQAir HealthPro Compact Plus air purifier only sold at AllergyBuyersClub.com. Cares about their health and wants only the absolute best air purifier available. 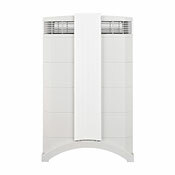 Has serious allergies or asthma and needs the best filtration of large and ultra-fine particles available. IQAir's HyperHEPA filter outperforms most conventional HEPA air purifiers in allergen and particle retention by a ratio of 100:1. Lives in a smaller-sized home, condo or apartment and wants a more compact version of the best-selling, 5 star, IQAir HealthPro air purifier. 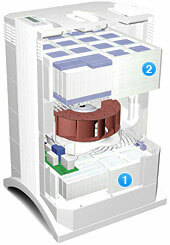 The IQAir HealthPro Compact air purifiers take in air through dual arches at the bottom of the unit. The air first passes through the PreMax pre-filter(1) which captures micro-particles such as pollen, pet dander and mold spores. Air is then drawn through the fan and into the HyperHEPA filter(2) which eliminates bacteria, viruses and combustion particles from automobiles and smoke, through a nano-fiber structure. 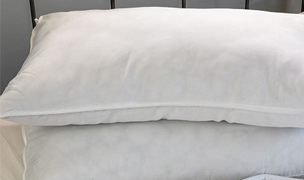 Clean, purified air is vented through the 320° EvenFlow™ diffuser at top of unit. 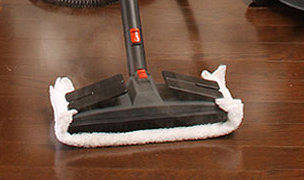 The air outlet diffuser is designed to outflow low turbulence, low velocity air which creates less noise. IQAir air purifiers are equipped with an electronic Filter Life Monitor that calculates the remaining life of the system’s filter elements. Thanks to the filter life monitor, the user does not have to guess when filters need to be replaced orreplace them at fixed intervals (which rarely correspond to the actual amount of use). The filter life monitor watches over the most important factors affecting the life of the individual filter elements. The filter life monitor display shows the remaining life of each individual filter elements at any given time. IQAir and AllergyBuyersClub recommend running your IQAir HealthPro Compact air purifier for 10 hours a day on speed setting 3. Thanks to its superior performance and filtration, it does not need to be run 24 hours, 7 days a week. The average filter life for 10 hours of use per day on speed setting 3 is outlined below. IQAir air purifiers can be set to run at six different fan speeds which correspond to six different air flow rates. The higher the fan speed, the more room air will be filtered by the system. 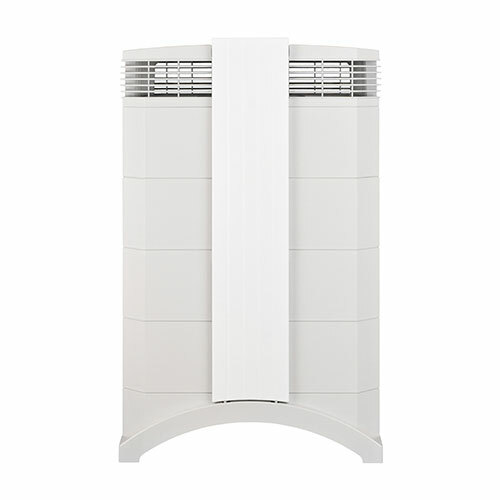 The high fan speed settings provide additional air cleaning power to deal with situations of elevated pollution levels. 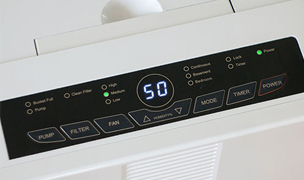 To allow better evaluation of the system’s performance at different fan speeds, the standard display window shows fan speed and the air delivery rate (air flow). For general air cleaning purposes, the IQAir system should be able to filter the room air volume at least twice every hour on the set fan speed to achieve a significant air quality improvement. If the intensity of the pollution source is high or a high degree of purification is needed, more air changes may become necessary. Under normal conditions, IQAir and AllergyBuyersClub recommend running your IQAir HealthPro Compact air purifier for 10 hours a day on speed setting 3 in a room around 500 sq. ft. with an 8 ft ceiling. 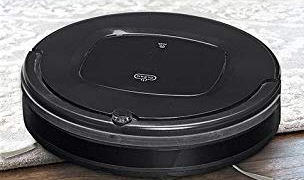 Thanks to its superior performance and filtration ability, it does not need to be ran 24 hours, 7 day a week to sufficiency clean the air in a room. Using the daily & weekly programmable timer functions will help operate your IQAir air purifier at maximum efficiency, in accordance with your lifestyle. 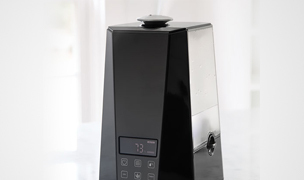 The programmable timer allows you to select a start time, end time and speed setting for the air purifier to operate at each day, Monday through Sunday. 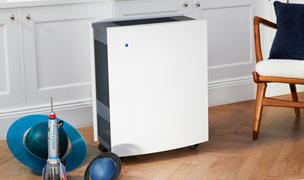 We were very happy when IQAIR developed the HealthPro Compact air purifier. The HealthPro Compact air purifier is not as tall as the standard HealthPro, yet delivers the same air cleaning performance along with the features and quality we have become accustomed to enjoying from an IQAir air purifier. 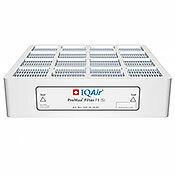 The IQAir HealthPro Compact uses a robust pre-filter that is a high efficiency, high-capacity, tightly pleated filter. 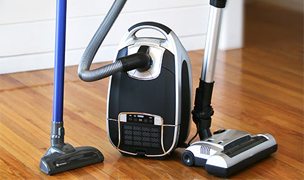 It captures over 90% of all dust and prolongs the life and performance of the HyperHEPA filter by a factor of 10. The IQAir HealthPro Compact's HyperHEPA filter has a micro-particle retention rate up to 100 times higher than regular HEPA filters providing cleaner air than any comparable HEPA air purifier. 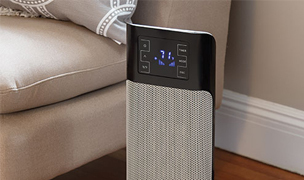 Though smaller in size, the IQAir HealthPro Compact air purifier uses the same fan and technology as the larger models and can clean an area of up to 1238 square feet (on speed 6 achieving 2 air changes per hour.) 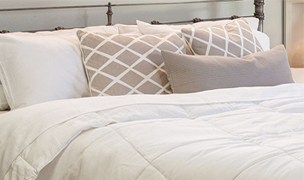 Maximum room coverage reduces in size depending on speed setting and desired air changes. The IQAir HealthPro Compact air purifier is good for bedroom use with lower than average noise level on the first two fan speeds, on the third speed it is a pleasant quiet background hum, speed 4 is a bit noisy but some users will tolerate it, and like all HEPA air purifiers, it is fairly noisy on speed 5 & 6 so you would probably want to use it on speed 6 when you are not in the room or at home. 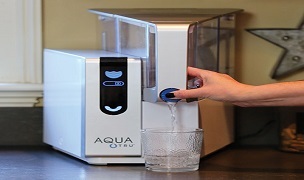 One of the big pluses of the IQAIR HealthPro Compact is its control options. 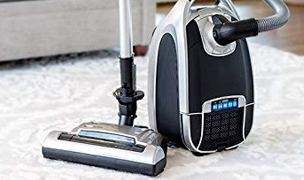 While we did not see the need for the remote control, we were impressed with the ability to set the machine to go on and off at certain pre-designated times and fan speeds. The four key touch pad displays the programming timer status, filter life and status, and fan speed. The HealthPro Compact's filters stack up modular fashion and can be changed in a matter of seconds with no tools necessary. They also are changed separately on an as needed basis which off-set the fairly high price of the filters if you were to buy them together. 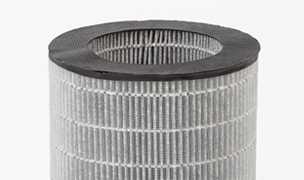 Average annual filter replacement costs are approximately $128.17. IQAir constructs their air purifiers from non-off gassing ABS materials that are UV stabilized and high impact resistant. 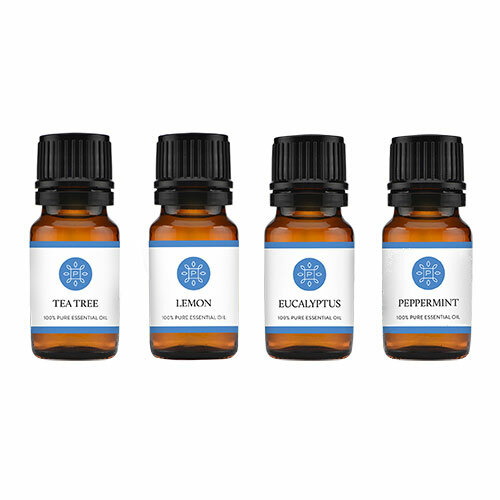 They only use healthy filtration technologies, adding no ozone, ions, UV or chemicals into the air you breathe. The IQAir HealthPro Compact air purifier has a three-dimensional seal between the filter element and the housing of the air cleaner that does not allow any air to by-pass the filters so all the air is cleaned. Filter change indicators are provided for both pre-filter and HyperHEPA filter. The filter indicator displays green until 20% of the filter life remains, orange when 20% remains, red when 10% remains, and flashing red when none remains which is when you should replace it. 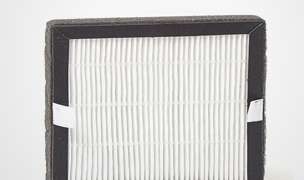 In good practice, you should order your replacement filter when the indicator is orange or red. 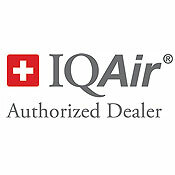 IQAir is a top-notch air purifier manufacturer who has been in business since the 1960’s selling air purifying products in hospitals and industrial cleanrooms. Each IQAir HealthPro Compact air purifier is measured at the factory and certified by the quality control engineer who tested it. Included in each box is a certificate of performance in air delivery, filter leakage, and particle filtration efficiency. IQAir will cover the HealthPro Compact for a full 5 years against defect in parts and labor since they consist of the highest quality components and are assembled in Switzerland with great care, pride, and attention to detail. IQAir designs and manufactures all of their filters so you can be assured of the quality which includes the completion of the tight seal to the housing to eliminate air bypassing and attain 100% filtration. Although it costs more than most air purifiers on the market, what IQAir provides in the way of quality, design, and filtration performance vastly outweighs the higher price tag. 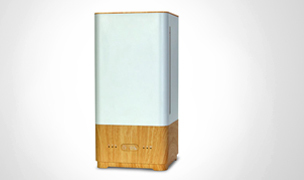 An IQAir air purifier is an investment in your health that is worth every penny. 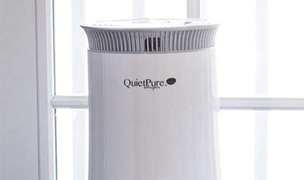 If quiet is the paramount feature you are looking for above all else, the HealthPro Compact is not our quietest air purifier, although it is far from the noisiest especially when run on the lower fan speeds. The HealthPro Compact does not have any gas filtration, however the Compact can be upgraded to the Plus model simply by replacing the PreMax pre-filter with the combination gas & pre-filter and does not require any reprogramming or replacement of the control panel. The combination pre-filter contains 2 pounds of carbon. If you suffer from allergies and want the 'best of the best' particle filtration that will remove large and ultrafine particles including viruses, cat allergens, bacteria/germs, house dust mite allergens, exhaust fumes, smog, soot and other super fine particles, the HealthPro Compact is exactly what you need. If you are looking for all around air purification of particles and gas & odor control we recommend the HealthPro Compact Plus which uses carbon in its pre-filter. 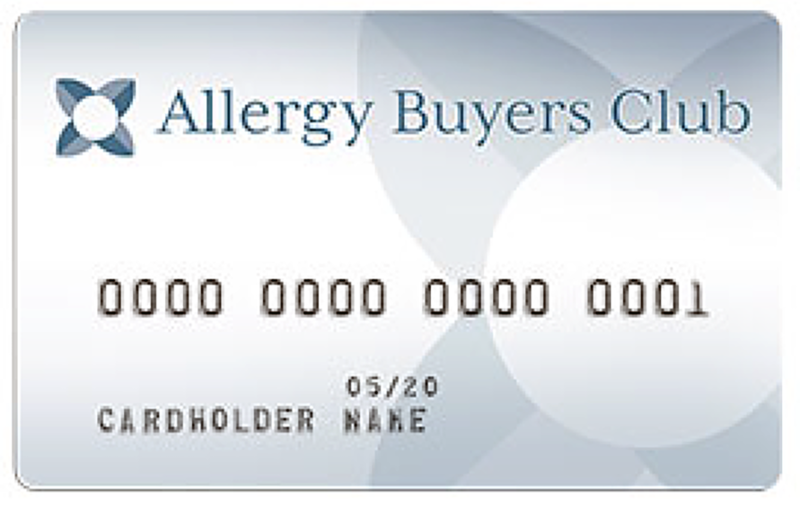 However, if the main concern is allergens and harmful particles, the HealthPro Compact is the more affordable option. You can always replace the standard PreMax pre-filter with the combination gas & pre-filter if gas and odor filtration becomes a concern. 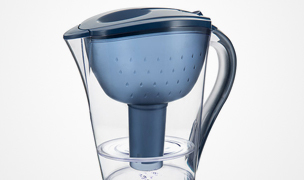 Includes 1 replacement pre-filter for the Healthpro and Healthpro compact series. Replace filter every 18 months. The machine displays this as Filter #1 (Item #102-10-10-00). Includes 1 replacement HyperHEPA filter for the HealthPro and HealthPro compact series. Replace HyperHEPA filter every 4 years. The machine displays this as Filter #3 (Item# 102-14-14-00). Includes Pre-Max pre-filter #1 and HyperHEPA filter #3. Item# 102-10-10-00 & 102-14-14-00. 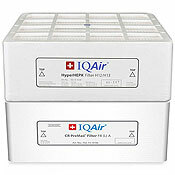 Complete filter replacement for the IQAir HealthPro Compact Air Purifier.